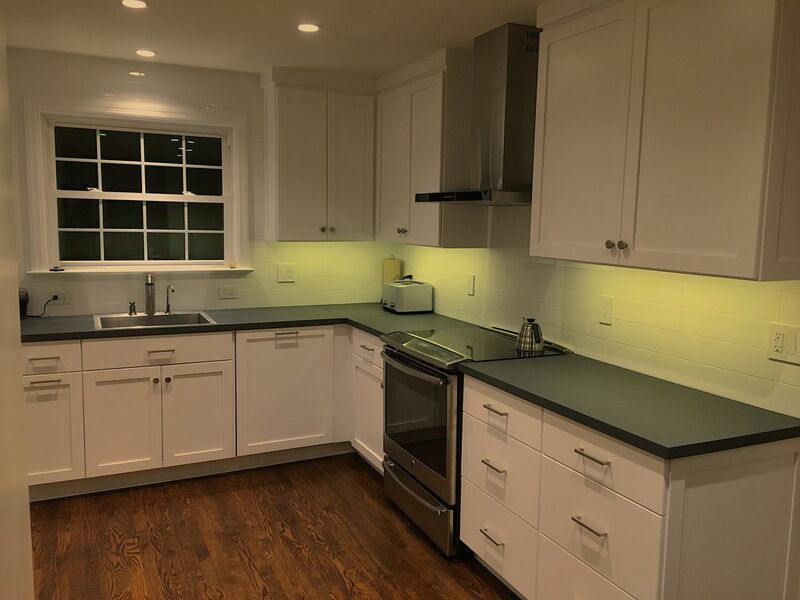 Completely Remodeled, Updated, Perfect Location Next to Downtown/PSU! Amazing house in the best neighborhood in State College. Located in the tree-lined, picturesque Holmes-Foster neighborhood, this house is super close to downtown and PSU campus. The house is a charming cape-cod revival that recently underwent a complete remodel and renovation. Everything is new, clean, and energy efficient. Parking (3 cars max) and internet are included. The house has 3 bedrooms and 1.5 baths. Floors are hardwood and natural stone tile. The house has a high efficiency multi-zone heat pump/ac and the upstairs bathroom has radiant floor heating under slate. The house has a 75 gallon high efficiency heat pump water heater, so there is a ton of hot water for everyone. The kitchen features an induction range, high-efficiency Bosch dishwasher and Fisher-Paykal refrigerator with custom-built Amish cabinets. There are two fireplaces, a garage (off-street parking for up to three medium cars - 1 in garage and 2 in driveway - a tight fit but it works), and a great outdoor space with a grill, table, and chairs for warm weather. A lot of State College's best places for food, drink, and entertainment are within a 10-minute walk. The house has a fast internet connection (200 mbps download), cable TV, and a printer. There is a large high efficiency washer/dryer and an iron and ironing board. There are three bedrooms with queen sized beds, all with high-quality linens. A nice and large, semi-finished basement has another high-end, queen-sized bed, bringing the total to 4 queen beds in the house. In a pinch, the couch in the living room can hold an additional 2 people and another person could sleep on the cushioned hutch in the kitchen. There is also a twin-sized foam mattress that can be used. The Holmes-Foster neighborhood, where the house is located, is one of the original neighborhoods of State College. It is characterized by interesting and classic architecture, tree-lined streets, parks, and being close to downtown/campus and yet quiet and residential. The house is on a small hill that locals often use for running sprints and the PSU golf course (nice also for jogging around) is a 5-10 minute walk. Everything you need is close by and it is easy to get in and out of town. If you're going downtown or to campus, walking is often the easiest and fastest option - or biking if you bring a bike! Beaver Stadium is on the far side of campus from the house, but is still only 2 miles, so definitely walkable. There is also a bus service that stops nearby on Atherton if you don't want to walk. Other campus events will be closer. You'll get a ticket if you park overnight on the street in front of the house, but you can put one car in the garage and two in the driveway if needed. If you have big vehicles only 1-2 may fit. I'm a professor at Penn State. I split my time between State College and NYC. This is my personal home, but I rent on weekends or other times I'm away. Beautifully renovated home that’s convenient to town. Owner was very nice, organized and responsive. Hope to stay there again soon! Great location and short walk to downtown. Enjoyed a PSU football game with siblings. House is updated, beds and pillows very comfortable! Would stay again! Great location and charming home. The property has everything you need. We enjoyed a football weekend in this home. It had everything we needed and is very comfortable. The owner was great to work with. The instructions for staying in the home and using the amenities are detailed and simple to follow. I hope to stay here again sometime. The house is clean, new, appointed with high quality everything. Beds are very comfortable and lots of them. We used washer and dryer - worked well. Johnathan was responsive when we had questions. We rented again for next year we loved it so much...so much nicer than being in a cramped hotel room! Had a lovely family & friends football weekend stay here. Arrived Friday afternoon, parked the cars in the garage and driveway and walked to restaurants and the game. Very conveniently located and never had to worry about traffic! House is beautifully appointed and Jonathan makes staying here easy. Highly recommend. We rented the house for six weeks in the summer of 2018. We really loved the house; it’s cozy, and calming . It’s a walking distance to State college downtown. We liked two things the most: the lights with 10 intensity levels and the SONOs. The host is very helpful and generous. Contact me with any questions or for a discounted rate for extended stays.